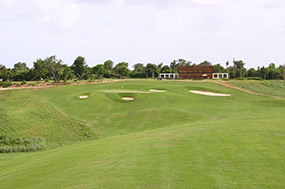 It’s hard to know what the brief to Pete Dye was for the Dye Fore course at Casa de Campo, and even harder to guess what the iconic designer himself was thinking when creating this layout. 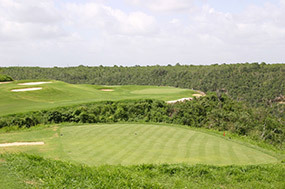 The site is dramatic and enjoys very pleasant views of the distant sea and over the Chavon River some 300 feet below, but not even the most creative marketing minds would suggest for one minute that it was in the same league as Teeth of the Dog. 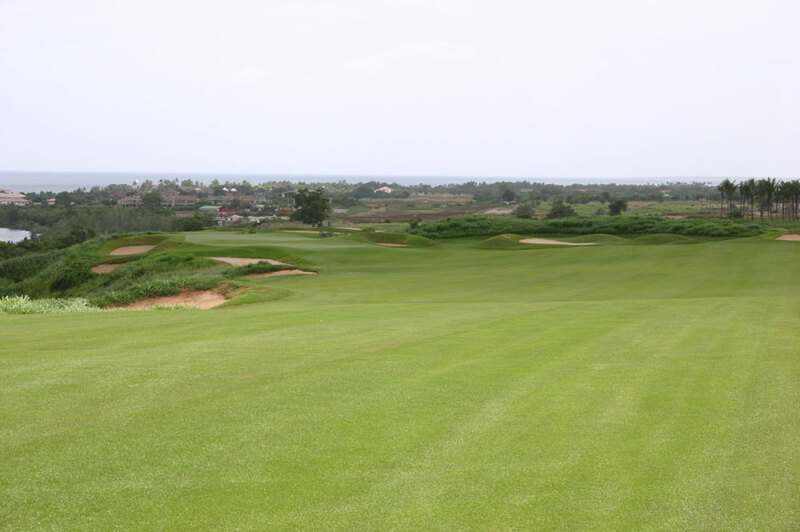 That fact might explain why Dye opted to give this elevated site the full treatment, and build one of his most outrageous and over-the-top designs. There is nothing subtle at all about Dye Fore, the shapes are deliberately exaggerated, the bunkering is in your face and in several spots the strategic decision is to either take an enormous risk or an equally enormous detour. 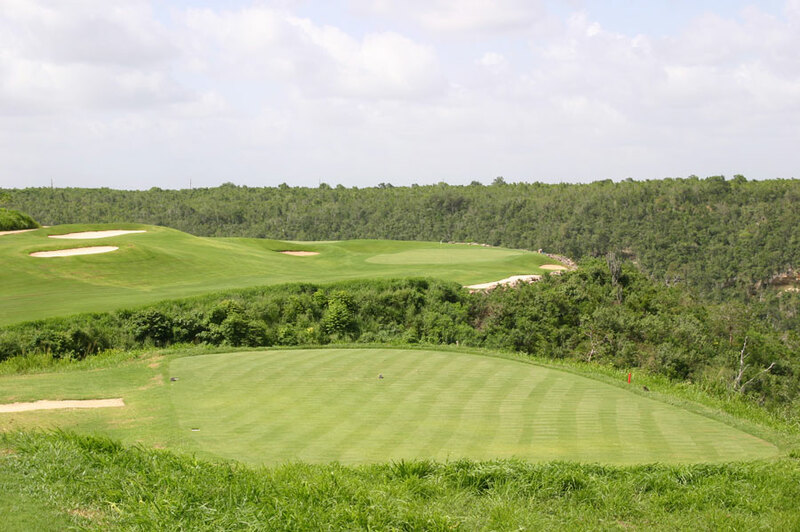 The routing includes several holes that border on the ridiculous, such as the unsightly bunkering and mounding of the front nine par fives and consecutive push-up holes at 16 and 17 that are tortuously cruel on slicers. Years later I’m still trying to figure out what to make of the roller coaster par five 18th hole, with its odd slot view of the green down the shorter left hand side. Still, for all its obvious flaws there is something compelling about this test and a handful of holes are quite fine. 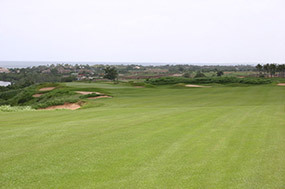 These include the left bending 4th played down toward the sea and the two back nine par threes that head across a ravine. 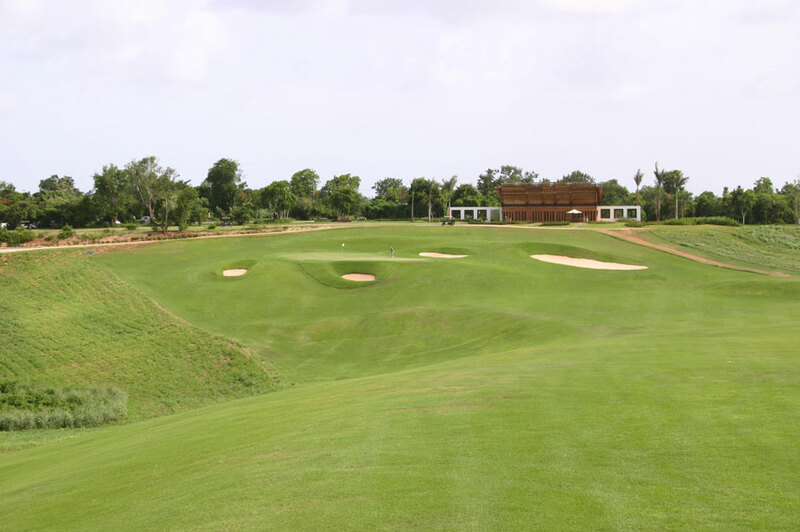 Dye Fore is clearly not to everyone’s taste, but is so unusual it probably warrants a look for those spending any length of time at the Casa de Campo resort. For flying visits, however, stick to Teeth of the Dog.